The Champions League group stage draw that took place on Thursday resulted in some interesting matches that include Pep Guardiola’s Manchester City facing Barcelona, the first club he managed; and Real Madrid taking on German side Borussia Dortmund, a team greatly weakened by the departures of key players Matts Hummels, Henrikh Mkhitaryan and Ilkay Gündogan. Barcelona will also have to play against Celtic and Borusia Monchengladbach in Group C, while Real Madrid’s other opponents in Group F are Sporting Lisbon and Legia Warsaw. In Group A the most attractive matchups will be between PSG and Arsenal, with Switzerland’s Basel and Bulgaria’s Ludogarets completing the group. 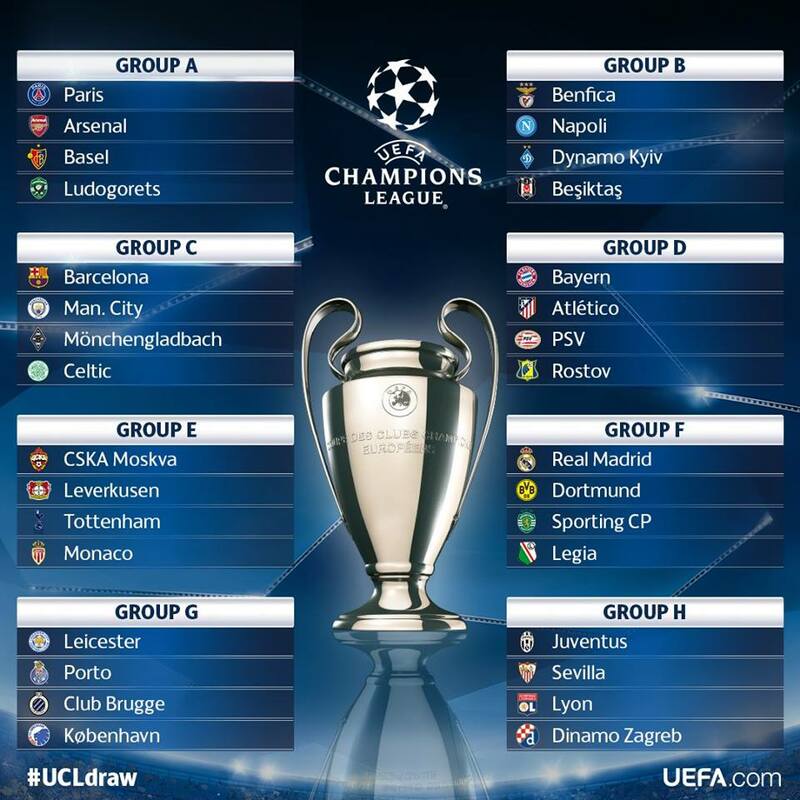 Group B contains Portugal’s Benfica, Italy’s Napoli, Ukraine’s Dynamo Kyiv and Turkey’s Besiktas. In Group D the main dish will be the games between Bayern Munich and Spain’s Atletico de Madrid. Carlo Ancelotti, Bayern Munich’s new coach, will try to help the German powerhouse avenge loss that his team suffered in this year’s semifinals at the hands of the “Colchoneros”, a very feisty team coached by Argentinian Diego Simeone. The other two teams of the group are PSV Eindhoven and Rostov of Russia. Group E features none of the teams considered a favorite to win it all this year, but as a result, this could be a very evenly matched group where anything could happen. Tottenham could be considered a slight favorite due to their youth, the great campaign they had last year in the Premier League and the fact that they kept most of their stars. Bayer Leverkusen are also talented and young but this is their second straight year in the competition and so they should be more than capable of putting up a good fight. They will most likely finish first or second. The two teams completing this group are CSKA Moscow and Monaco. In Group G the teams squaring off are Leicester City, the surprising Premier League champions, Portugal’s Porto, Belgium’s Brugge and Denmark’s FC Coppenhagen. Not a bad draw for the English champions, considering this is their first time in this competition and will not have to face a European powerhouse during the group stage. Finally in Group H Juventus will be the favorite to run off with a group made of Sevilla (champions of the Europa League three years in a row), Lyon and Dynamo Zagreb. Even though Sevilla lost Coach Unay Emery and key players Kévin Gameiro, Éver Banega and Grzegorz Krychowiak, they have already proved that they can recover from losing important pieces. Sevilla should manage to finish second and advance out of the group stage for the first time in club history.